Up-to-date meetings and demanding congresses need intelligent electronics! Not only excellent acoustics, but also the ability to control and organization is necessary in today's hi-tech presentation environment. 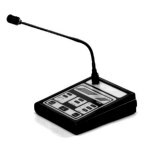 Microprocessor controlled Interkom conference microphone systems stand out as the easy, effective and safe solution for your conference operations requirements. High end microphones as well as built-in two-way loudspeaker systems at every delegate station always produce broadcast quality, intelligible audio. Speech requests and speaker recognition with integrated microphone remote control are part of the Interkom central control concept. The iCC and DMC systems offer a fully integrated multifunctional electronic voting system which totals and establishes all voting results within seconds. All Interkom systems meet or exceed International standards including IEC, ISO and DIN. SHOWORKS can design an install or rent a Interkom system tailored to your specific requirements. Call SHOWORKS today for more information or use our online request form.